You may think that a homeowners insurance policy provides adequate coverage for all your valuables, but policies may provide limited or no coverage for certain items — including generally expensive items — that are damaged or stolen. For example, many homeowners policies generally have a $1,000 or $1,500 coverage amount for jewelry if the loss is due to theft. Such limits are in place to help keep homeowners policies affordable. However, if jewelry valued at $2,000 is stolen from your home and you have a $1,000 policy limit, you can only receive $1,000 from your insurer to replace the missing items. That is when an insurance endorsement (sometimes called a rider) can provide increased coverage for your possessions. 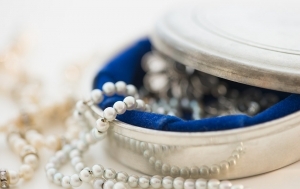 For an additional premium, this coverage can help protect you from the loss of high-end valuables such as jewelry, furs, antiques, artwork and collectibles. Here are five tips that may help you decide whether you need valuable items coverage. Your insurance policy is a contract between you and your carrier. This document includes the limits of how much you will be compensated when certain valuable items are damaged or stolen. Note that certain items may not be covered, so be sure to carefully review your policy to determine whether you have insurance that meets your needs. 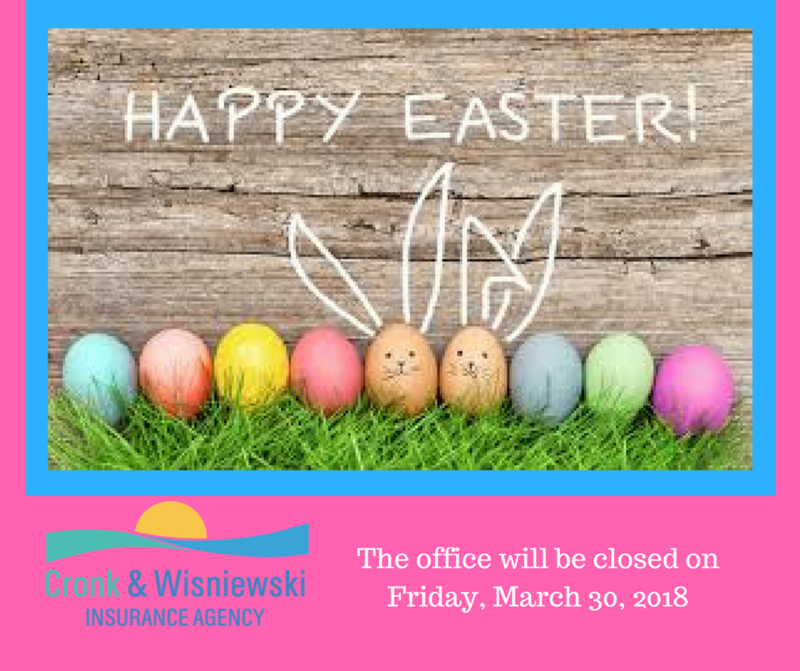 If you have questions, contact your insurance agent. You may have possessions that are worth more than you think. To help you decide whether you need additional coverage, it may be helpful to have them appraised. An appraisal can help you determine if your homeowners insurance policy covers the full value of your property, as some items may not be covered. The value of some items, such as collectibles or jewelry, may be difficult to determine without professional assistance. It may be necessary to have your valuables reappraised periodically. If they increase in value, you may need additional coverage. You may not be able to make a decision about whether to buy additional coverage until you know exactly what you own. You may want to take stock of your possessions by creating an inventory. Do not forget to check your garage, basement or attic for stored valuables, such as antiques and coin collections. Be sure to list all items of value and include copies of receipts or appraisals when possible. This may help you if you ever need to file a claim with your insurance carrier. If you live in a community where the crime rate is high, you may have a greater need for additional coverage to protect your valuables. Police departments may track crime statistics and share this information with the public. You can consider asking your police department about home burglary trends in your neighborhood. Also consider installing a security alarm system. An alarm system may qualify you for a homeowners insurance discount. In our increasingly high-tech world, people use their electronic equipment to perform their jobs and maintain social connections. In recent years, many new gadgets and devices have been developed that may enhance our lives. If you keep high-end computers and other electronics in your home, you may want to make sure your homeowners policy will cover their loss. Your need to insure valuable items is something you may want to discuss with your agent whenever you buy a homeowners policy. If you purchase additional coverage for high-cost items, it is a good idea to understand its limits and exclusions. When Can My Child Ride in the Front Seat? For many children, there’s a certain magic to riding in the front seat of a car. Some may view it as a rite of passage into the preteen years… while others just want a change of scenery. But regardless of the reason, every parent will eventually find themselves answering whether it’s time for their son or daughter to graduate from backseat riding. And as adults, we shouldn’t rely on our own childhood experiences to answer that question. Laws and vehicle safety standards for children in the U.S. have changed a lot over the years. It wasn’t until the 1970s that child safety seats were required to have belts and harnesses. It took another 10 years for federal car seat crash tests to become standard. So how do you know when your child can – or should – ride in the front seat? Finding an answer to this question is more difficult than you’d think. Here’s the tricky part: Unlike the transition from rear-facing to forward-facing car and booster seats, there’s not a standard go-to milestone for moving your child up front. Like many parenting decisions, it’s up to you to know what local laws are and sort through what the experts recommend to determine what’s best for your child. How old is your child? According to the Centers for Disease Control and Prevention (CDC), all children should ride buckled in the back seat of a vehicle until they are 13 years old. Though some argue that age isn’t always the best determining factor, the agency has established this as a safe guideline for parents. How does the seatbelt fit? Your child’s height and weight also play an important factor. If the vehicle’s seatbelt doesn’t fit correctly, they could be at risk of injury in an accident. Before you ditch the booster seat, make sure the seat belt sits low on your child’s hips with the shoulder strap resting across their collarbone and chest. Are the airbags active? Front airbags deploy at speeds approaching 200 mph, which can seriously injure a child riding in the front seat. Because of this, many newer vehicles have a sensor that automatically disables the airbag for lighter passengers. Others have the option to manually disable the airbags. If your airbags are active, the front seat isn’t a safe place for your child. What are the laws in your state? Each state has different laws when it comes to children riding in the front seat. Depending on your state, laws could be set by your child’s age, height and/or weight. Check the laws for your state on the Governors Highway Safety Association website. However short the trip, make sure your child is safe and secure. Set the example early by always using your own seat belt. In the event of an accident, you’ll be thankful you made safety a priority. From Saturday morning errands to an epic family road trip, it’s our pleasure to help you stay safe on the roadways of life. See what makes ERIE auto insurance different or get a free quote from a local agent near you. https://cronkinsure.com/wp-content/uploads/2016/09/Cronk-Logo-II-new-300x154.png 0 0 Yvette Hindman https://cronkinsure.com/wp-content/uploads/2016/09/Cronk-Logo-II-new-300x154.png Yvette Hindman2018-09-20 09:41:392018-09-20 09:41:39When Can My Child Ride in the Front Seat? 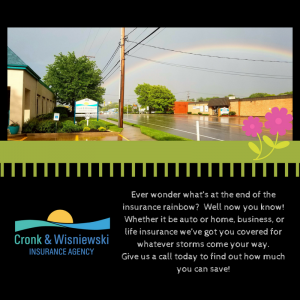 Ever wonder what’s at the end of the insurance rainbow? Even people who love winter do not enjoy one of the season’s most unpopular jobs: clearing snow and ice off their cars. Turning on your front and rear defrosters as soon as you start clearing. If you have a push start, now is the time to take advantage of it. Give yourself more time than you think. This can be a tough job, and you may need a break or two after scraping away at ice for a long stretch of time. Don’t pull on frozen windshield wipers! This could totally ruin them. Instead, use an ice scraper to chip away at the ice and give the car defroster time to do its job. Use a proper snow brush. Shovels and other brushes not marketed for safe use on cars can leave behind scratches. Start from the top. Clear snow from the the roof and work your way down—clearing the top part of the car later could undo the work you did on the bottom half of the car. And you can’t drive around with a roof full of snow anyhow. Consider using a deicing spray. Commercial-grade sprays can make the job faster and easier. Blow through a straw to let your breath melt a frozen lock. Another option is to apply a bit of hand sanitizer to your key and the door lock. Of course, the best way to deal with winter is to park your car in a garage or carport. If that’s not possible, try taking these steps beforehand. Place socks over your windshield wipers and pop them up. This will help prevent them from freezing. Put plastic bags over mirrors. Use rubber bands to secure them into place. Spray a little cooking oil on rubber seals. This will help prevent them from sealing doors shut. Apply ice prevention spray on windows. You can find this product at auto specialty stores. Cover your windows. A piece of cardboard, towel or folded sheet can help prevent ice from forming on your windshield. Face your car east. In for the night? Then try to park your car facing east so the rising sun can help melt the snow and ice. Clearing snow and ice off your car isn’t the most fun job, but it helps keep you and other drivers safe–and it may even be the law in your state. While renting a new place to live can be an exciting venture, thinking about renters insurance is probably the least exciting part of the experience. When you’re already trying to make your budget stretch to cover a litany of new expenses, it seems difficult to justify adding another one to your list. However, since your landlord’s insurance will not cover the loss of your personal assets in an event such as a fire or burglary, renters insurance is a necessity. Fortunately, renters insurance is easily one of the most affordable types of insurance coverage. In order to properly answer this question, you must take inventory of all of your possessions and assess their value. In addition to the big ticket items, such as electronics, furniture, and valuables, be sure to include the cost to replace things such as kitchenware, textiles, and clothing. Remember that your reimbursement costs will only be as much as the amount of coverage you choose. Those little items around your home add up! In addition to covering the loss of personal property, your coverage should also include liability. This will cover medical expenses, should someone be injured while on your rented property, as well as legal expenses, in the event of a lawsuit. While liability coverage will increase your premium, keep in mind that these types of expenses can be hundreds of thousands of dollars, and coverage is likely more affordable than you might think! Just like the value of your car, the value of your belongings depreciates with age. Insurance companies will offer you a choice between actual value coverage and replacement cost coverage. Actual value coverage insures the depreciated value of your belongings (in other words, the original cost of the items). Replacement cost coverage, on the other hand, covers the current market value of your possessions. Of course, while replacement cost coverage will be more expensive, it can be invaluable when replacing lost or damaged property. Your deductible is the amount you pay out of your pocket before the coverage from your policy kicks in. Deductibles vary widely in range, with the average between $500 and $1,000. If you choose a plan with a low deductible, your month to month premium with be higher than it would with a higher deductible. On the other hand, if you have a high deductible, then when the time comes to replace your belongings, you may find that your deductible is higher than the cost of replacing your items. When you take into account all of these factors, the next question you should ask yourself is ‘where do I get renters insurance?’ The best way to determine exactly how much coverage you need and what the cost to you will be is to talk to an experienced insurance agent. 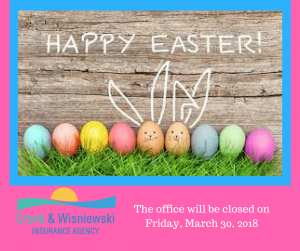 At Cronk and Wisniewski Insurance Agency, our agents can help you determine what type of coverage is right for you. We want to make sure you find a policy that covers all of your needs at a rate you can afford. Don’t let another day go by without protecting your castle. 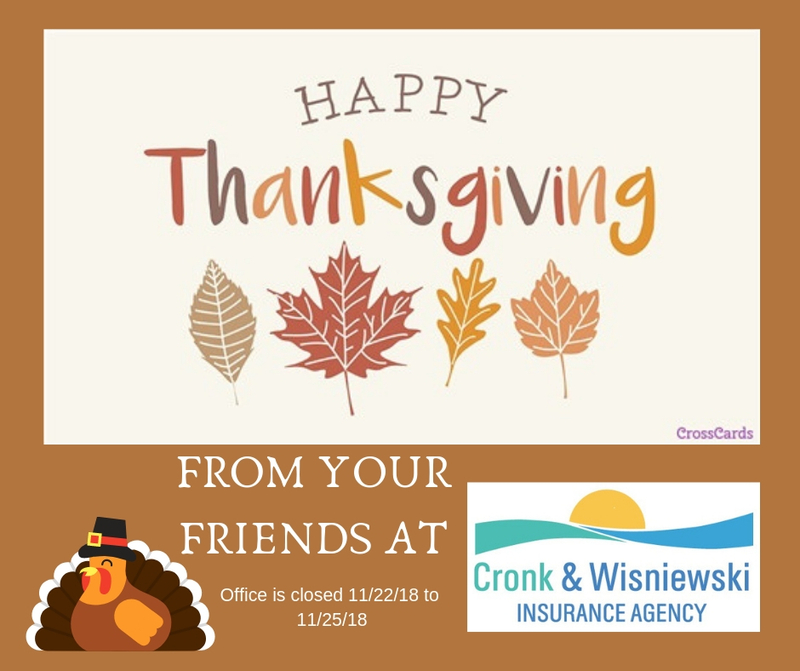 Call Cronk Insurance today at (814) 456-7501 to get more information and get the peace of mind you deserve! 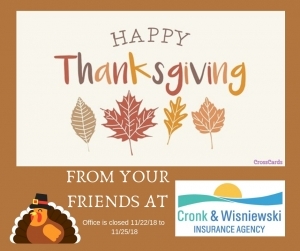 https://cronkinsure.com/wp-content/uploads/2017/01/uev-ai_dsdi-anneliese-phillips.jpg 602 900 Joe Birch https://cronkinsure.com/wp-content/uploads/2016/09/Cronk-Logo-II-new-300x154.png Joe Birch2017-01-16 14:11:532017-10-16 15:42:03How Much Is Renters Insurance?